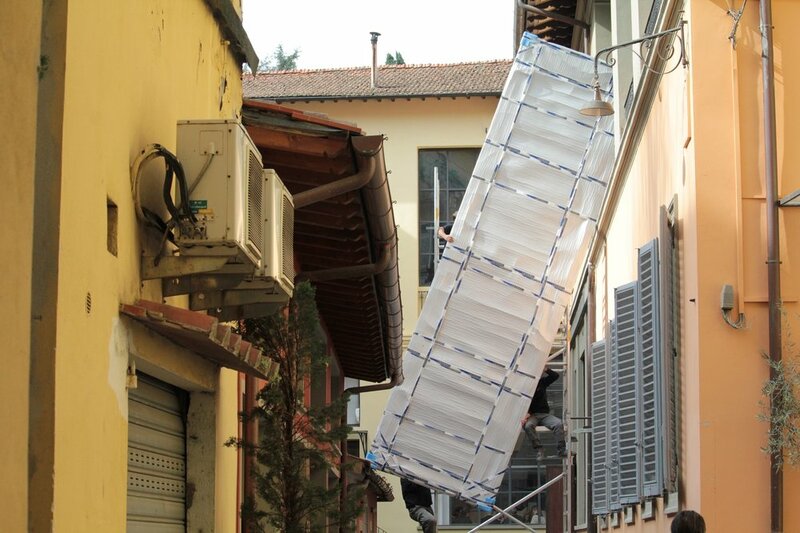 Expert transporters hoist 191-pound canvas through the window into the restoration lab. Home >> Art in Need >> What can I help restore? >> Nelli's The First Last >> Adopt an Apostle >> Saints Alive! Nelli’s Apostles are life-size. How did she paint them? To put them to canvas she would have needed to construct scaffolding and climb up it to paint the saints’ upper bodies. We are talking about a self-taught artist with no training in Anatomy. Indeed for women (and especially nuns) live-model drawing was unheard-of and illegal. It is thought that Nelli used women models; but she undoubtedly had contact with men as well, as her convent was cloistered only for part of her stay there. Our conservator believes that Nelli would have needed male help to stretch her 21-foot canvas. To get it into the restoration studio, we needed six strong male transporters! The canvas (without a frame!) weighs 191 pounds. One thing is certain: Nelli and her sisters were no sissies. The ‘Adopt and Apostle’ project is a big gesture of love for an even bigger work of mastery. If Nelli’s saints could talk, what would they tell us?